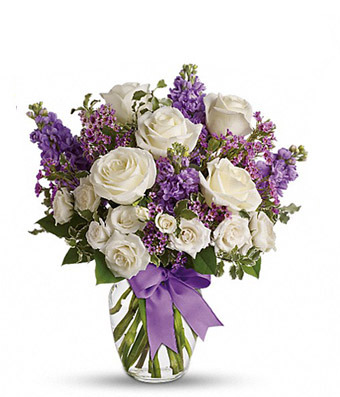 Lovely lavender and white flowers in a clear glass vase with a purple bow. 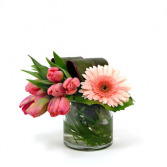 Pink Tulips and a Gerbera daisy in a clear vase with a tres chic look. A colorful mix of Gerbera daisies sure to bring a smile to the face of someone special. A colorful collection of orange roses, hot pink carnations, magenta stock, and orange spray roses accented with baby eucalyptus in a clear glass vase. 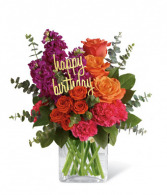 Send someone special a birthday gift today!